It's Sunday and there is freezing rain happening as I type this. I just hope we don't lose power! The weather is so wonky these days. Thank goodness I shoveled the driveway this morning or that foot and a half of snow would have ended up a block of ice by tomorrow! I have to say though, I was ready for a quiet Sunday in my pj's. I always say I live by the seasons and I ain't kiddin'. When Mother Nature decides to lay down weather, we must reschedule sometimes!!! And before the freezing rain, we had snow. It was really nice, big flakes! This is a busy week. Shopping week so that means menu planning and sifting through flyers...I have to say I'm not in the mood for that. I'm back on a bi-weekly shopping trip, sigh...I need to organize myself and get back to my monthly plan soon. I hate driving in the winter! We used to be big pizza eaters. 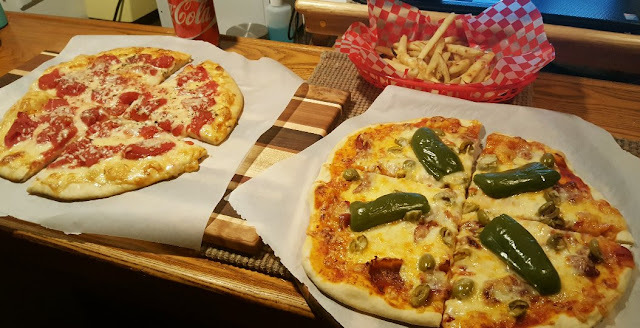 Okay... my husband and sons still are, but I've gotten burnt out over the years - we've celebrated Pizza Day, Pizza Week, and any other reason to eat pizza. lol I have to say, though... while pizzeria pizza holds little appeal to me these days, those homemade pizzas look yummy. I haven't made pizza in a long time. Maybe it's time to try again... ;^) Your fudge takes me back to my childhood. My mom made delicious fudge. And yes, it's tricky. 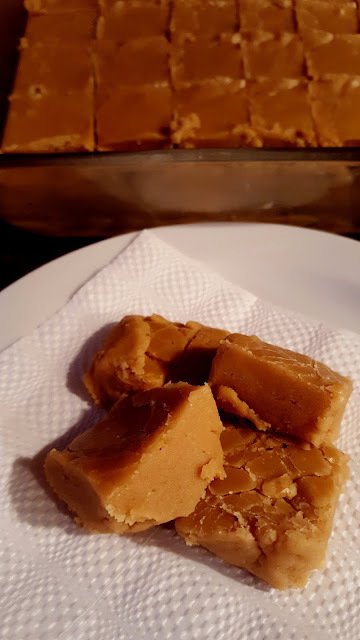 I remember a few times eating fudge with a spoon because it didn't set up, and a few times eating it in small pieces because it was too crumbly. But even in those states, Mom's fudge was yummy. That's something I don't make but every few years - but not because I'm tired of it. Because I'd eat the whole plateful! MMMM...fudge! I was afraid to open your blog when I saw the title; luckily I don't have any cream in the house. So you have to know which recipes you'll be experimenting with for an entire month before making your shopping list. That's some impressive organization right there. When I was a girl and friends would get together for sleepovers, we would ALWAYS make fudge! I usually don't make fudge except at Christmas time, and I haven't even done that for the past few years! A good fudge is yummy, but I think we prefer all the "special" Christmas cookies over fudge which can be very sweet. Having said that, the best fudge recipe I have came from the mother of a guy I dated in high school . . . which was a hundred or so years ago! you are such a good cook! Good looking fudge and pizza. My mother used to make fudge and would spread it out on old meat platters as I guess the thick ceramic worked better for some reason. People would expect it as Christmas gifts. Your pizzas look delicious! I love homemade fudge. I haven't made it in years. My first attempt was from a recipe that the Cora Restaurant chain had posted on its website. Then they took it down. I haven't checked to see if the recipe is back up. But anyway, it was an easy recipe and sooooo good. Now that I'm back to exercising regularly, which makes me feel less guilty about eating this stuff, I may have to make some more fudge. Love pizza and make it at least once a month. My dear friends Italian Grandma's family recipe for the crust. I don't make candy as I would be the only one eating it and I don't need to do that. Glad you enjoyed your Sunday thanks for sharing! You pizza looks so yummy. Homemade dough! I am very impressed. Your video if the snowfall is lovely. So pretty to look at bit so nasty to shovel and drive in. I have tried cooking fudge and have been successful once or twice but it has been a total bust more often. As you said, it is all about the temperature. Have a lovely Valentine’s Day, Rain. Nothing planned here Rain. As usual I have a breakfast of porridge (no sugar) and loads of water. 3 beakers to be precise. I don’t have pizza, but love having chips. It’s a very disciplined and is living like a monk. The home doesn’t ask that I do. They’re very good to me. I’ve just set myself some parameters to live by. It was my fifth year of being disabled, recently. congratulations on the fudge success ,, I know it can be tricky, a lot of work but so good!! Your pizzas look amazing and i love the redcheck papers and baskets ,, makes me think of an old diner we went too. I will do pancakes on pancake day and as for Valentine's Day I'm making heart shaped chocolate cup cakes with the oozy centres, thats his treat, I'm making heart shaped sugar cookies for my grand daughters and letting them frost them. We all need these special days in the long winter to survive, a bit of fun helps, don't you think? Beautiful falling snow,, as if we need more ,,, lol,, I know you have lots already as we do too. Fudge. I used to make it all the time, when I was young. And it wasn't tricky, like this. Maybe you need to look up a much simpler recipe. Oh those pizzas! Delishhhhhh... And the chips presentation is so cute. Hope your weather doesn't get any worse. We had some ice here yesterday, but not enough to really mess with things. I always worry about power loss, with ice, though. Thank you! You showed me how to cross out words! It is now easy, but I had not noticed it. Thank you!!! My mom LOVES fudge, but we have never made it! My mouth is drooling over all this food! Wow girl, you can cook! Thanks for the video! So pretty! I live by the seasons too!! Big Hugs! Your fudge looks like the salted caramel I made at Christmas. Yum. No sweets here this week. Winter has put a few pounds on me, ha ha! Hi Jenn :) I didn't know there was a cheater fudge!! I'd like to try that one too! Thanks Gill :) Someone else told me to use ceramic to help it set better too, that's interesting. I do have a ceramic container, I'll try that next time. Hi Goatldi :) Homemade pizza is so dependent on a good crust! We make ours thin, we prefer that. Once in a while though I'll make a Chicago pizza and that is such a thick crust, it rises for 6 hours! Hi Marsha :) No thermometer required? I have to do some research! I've been making the dough for years now, I can't go back to store-bought now. :) The snow is very lovely but yes, it can be back breaking to shovel. At least we rarely go out so it doesn't have to be done every day. We do it in stages to help our backs and shoulders! Hi Terry :) Congrats again on being sugar free! I'm cutting down a little each year with the refined sugars. I love chips/fries...with some mayo it's really a good combo! I used to load my fries with vinegar but sometimes your taste buds change. Hi Laurie :) That's what I was going for with the red baskets and checkered liners, that diner look! :) I'd bought them last year when I saw them on sale and figured they'd be fun to have our fish and chips in! :) Oh boy, your cup cakes sound amazing! Oozy is very good lol! I agree, with our winters, we need extra comfort...and for us, food is the way to do that! Hi Wisps of Words :) I think next time I'll try that "no fail" fudge recipe and see how that works out. We ended up NOT losing power I'm happy to say though we had quite an ice storm overnight and some of the poor trees lost branches. :( Now it's back to arctic weather, bah! Hi Buttons :) Nice to see you again :) Winter is getting crazier. When I was a kid, I don't remember ice storms and rain in mid-winter...We have to adjust though. Hi Magic Love Crow :) Thank you! I love to cook and bake! I consider it a delicious hobby lol. Living by the seasons is a wonderful way to live, I'm glad you liked the video :) It was so peaceful that morning! Hi Sandi :) No, they are green peppers! I mentioned above to RO that we can't handle peppers, or any kind of hot or spicy foods. But we love that pepper taste. So far, cooking it with the peppers on top lets the juices and flavour come out a bit and we just take the peppers off to save our digestions! As big a mess it can make you have to admit...falling snow is beautiful. Also just laying there if no one has walked through it. Fudge....oh there again...sugar! Love fudge, chocolate, peanut butter, chocolate.....and no I did not make a mistake saying chocolate twice! You're so funny Pam :) I forgot my blogs were sugar-heavy lately ha ha! Tomorrow's dessert will make you jump through hoops let me tell you! ;) I'll post about that tomorrow night or Thursday!!! I'm not much of a fudge person, my Sherry is and knows making fudge can be tricky. But me, I like the looks of the PIZZA! YES! I hope the weather wasn't tooo tough! SOUNDS COLDDD! glad you shared the recipe. I hope your shopping went okay! Hi Dianna :) Ha ha ha...Hollywood snow!!! We call that "perfect" hard rain "Hollywood Rain" lol! funny, great minds think alike. Shopping is done...I got stuck in the slush and on black ice...I will regale you with the details later...I never want to drive in winter EVER again...gawsh. The pizza's look great. I meant to ask you last time how do I get a crispy crust making your dough. I have a stone but you have to preheat and I didn't because how do you get the dough on there as it is soft and with all the toppings? I don't have one of those paddles do I need to get one? It was very soft when I took it out...it was cooked but soft which I don't care for. Love the snow video...beautiful! Thank you! What is the consistency of fudge like? Thicker than a brownie of course, yeah? Is it hard or almost buttery? Your personal pizzas look good. I'll have to try making pizza dough again one day as the first was a big fail. Linen Looks . . . . . . .